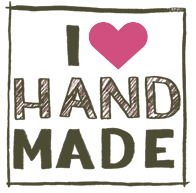 Sugar Soul Studio: I love Etsy!! 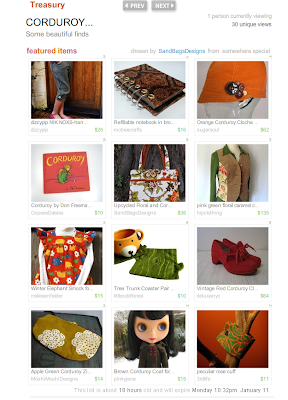 A huge thank you to SandBagDesigns for including one of my corduroy button cluster hats on her Etsy Treasury. What's Etsy? Well, the happiest place on earth if you love to look at and buy handmade and vintage goodies online. What's a treasury? A small collection of handpicked items that other fans of Etsy put together on a page to share. Its like having a personal shopper select their favourite things for you to browse. I've just stocked my Etsy store with 25 hats and I'll be adding more this week. It's super easy to sign up for an Etsy account so you can shop online (most shops accept PayPal, which is also super easy to sign up for). If you are in Edmonton and see something you like online, please email me or send me a message through Etsy. I will be at the Old Strathcona Market next Saturday, Jan 16th, and you can try it on in-person.